Hello Kids! Melvin A. Frubacher here, you<Guuuurghh> may remembur me as the manager of such bands as "No Town", "Front Street Boys", and "In Tub". My past markiting achievaments ledd me to explore "boy bands" of<BARK!>other musical johnras besides pop......well...that and the fact that part of my brain was destroyded in a near fatal car(nival) accident causing my banishment from the Hollywood boy band scene - I vowed that<OINK!> I would seak revenge by returning to the music world with a new band of my own creation that would dominate the music charts - Uh huh, and here is the final product, my brain child - THE FLAKES in their first press photo. 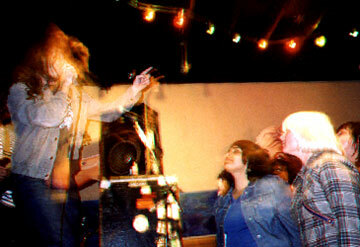 Yes folks, as soon as I <CUKOO!> saw these fine young gentilmens purform live at a club in Oakland I nearly pood myself. I had been traveling mersalessly for munths, and just when I was about to start searching outside Oakland's city limits, I finally found the group that<BOOOYAHHH!> I could mold into my personal money makin machine. I knew imediately that they had star potential when I saw the singer fall off the stage and ring his neck around a piano.